Last week I asked: Where can you take a scenic boat trip in NYS? Summer is the time to get out on the water and relax. You don’t need your own boat. There are plenty of places in NYS to enjoy a day on the water without the expense of owning and caring for your own boat. That is our concept – let someone else do the work while we enjoy ourselves. Of course you can always rent one. 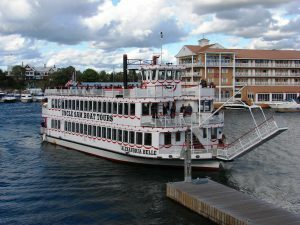 There are several places including the St. Lawrence where you can rent a pontoon boat and explore the 1000 Islands. Uncle Sam Boat tours and Clayton Island tours stop at Boldt and Singer Castle – but not on the same tour. For a classic polished wooden speedboat ride there is one offered at the Antique Boat Museum in Clayton. Nothing spells summer better than spending some time in the Adirondacks. 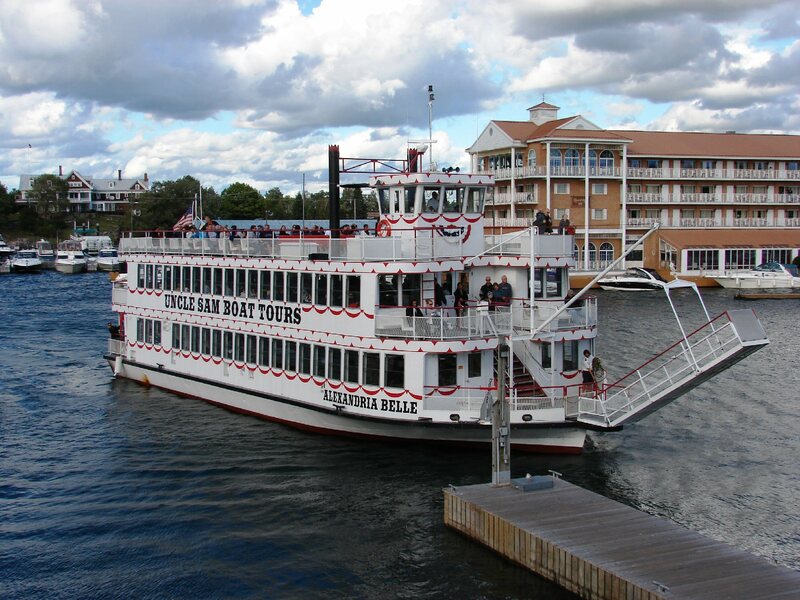 Old Forge Lake Cruises has several cruises on the Fulton Chain of Lakes in a classic steamboat. They have cruises that combine with the Adirondack Scenic Railway. I missed it for this year, but high on my list for next summer is their Rail and Cruise that includes the Loomis train robbery. There is also a boat tour on the Stillwater Reservoir offered by Norridgewock Lodge near Eagle Bay. 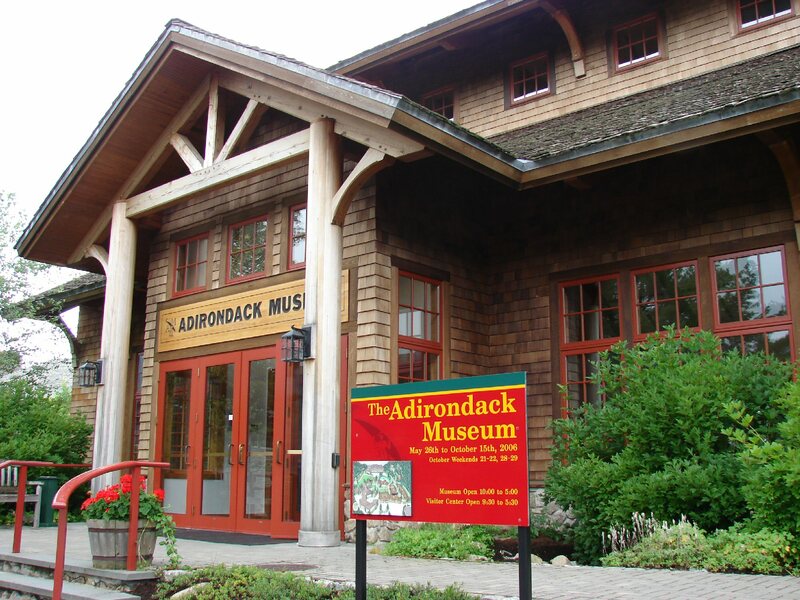 Check out the tours on Long Lake, Lake Placid and Lake George. All the Adirondack lakes are beautiful, but I am a bit prejudiced. I think Raquette Lake is the best because I spent many wonderful summers there years ago. The Raquette Lake Navigation Company’s Durant was built by the owner, Captain Dean Pohl who is also a marriage officer who has married more than 300 couples. There are several cruises to choose from and when the season ends in mid-October the Durant becomes the winter ice boat – no rides but many events. 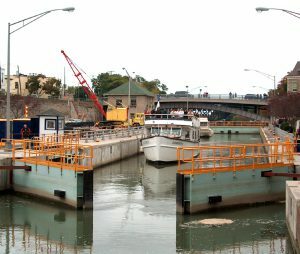 The Erie Canal is often overlooked by those of us who live so close but some people travel miles and miles to learn about the canal system of NYS. Erie Canal Cruises out of Herkimer offers cruises that include the Herkimer Diamond mines. Mid-Lake Navigation has a variety of tours on various sections of the canals and on also Skaneateles Lake. 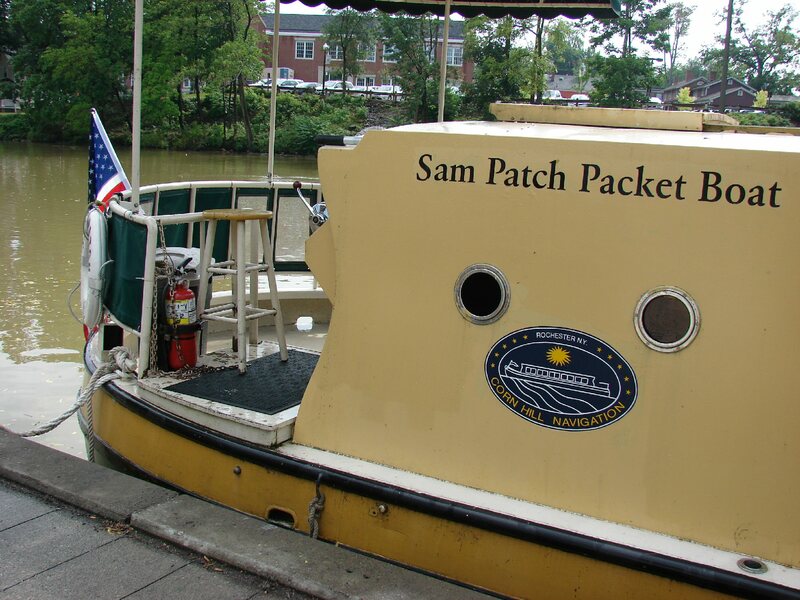 Sam Patch in Pittsford has daily cruises on a traditional canal packet boat as does the Mary Jemison departing from Rochester. 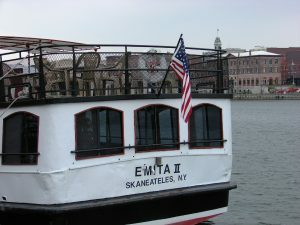 Also in the same area, is the Colonial Belle in Fairport. The highlight of any canal trip is locking through. On the Lockport Cave and Underground Boat Ride the boat travels “uphill” 60 feet past the Flight of Five Locks. The tour also includes a walk through a tunnel. The 315-mile Hudson River area is especially beautiful during the fall and there are many tour options. There are no low bridges or locks on the Hudson so the tour boats are larger and multi-tiered. The Captain J. P. Cruise Line out of Troy has a variety of special cruises. The Dutch Apple Cruises sets sail from Albany and like all the other cruises there is an historic narrative to inform passengers of significant places along the tour. Between Kingston and Peekskill there are several cruise companies exploring their part of the river. The River Rose is an authentic stern-driven Mississippi paddle wheeler. 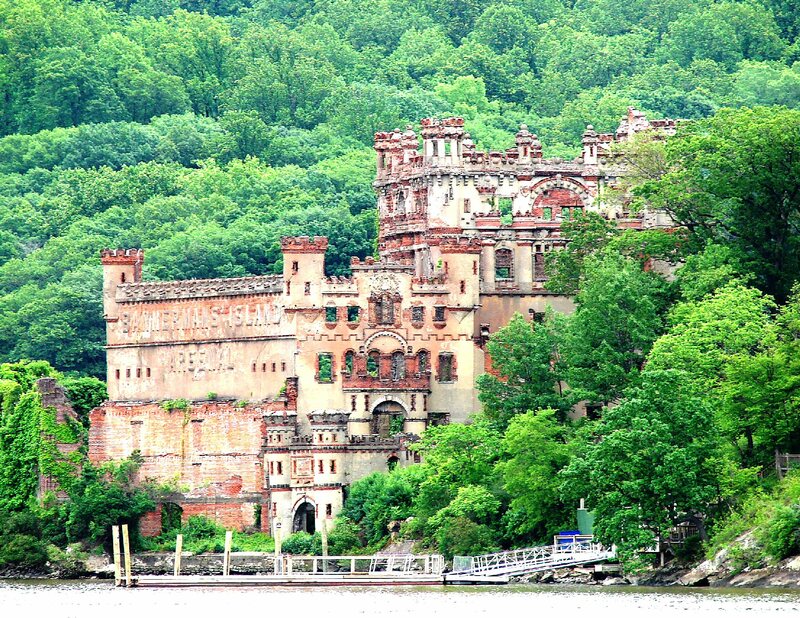 Views along the Hudson may include views of the haunted Bannerman Island, West Point and the Palisades of New Jersey. Manhattan is an island surrounded by the Hudson, Atlantic Ocean and the East River. Circle Line Sightseeing tour in NYC offers the only cruise that completely circles the island. Travel Trivia Tease™: Where can you ride a railroad hand car?